By now, many of us have lived a full, decades-long digital life. In an age and profession where—fortunately or unfortunately—information is increasingly easy to come by, both digital and non-digital proactive safety measures should be top of mind. So that you don’t have to rattle your brain for years of potential digital and online history, we created a tool to give you a head start. 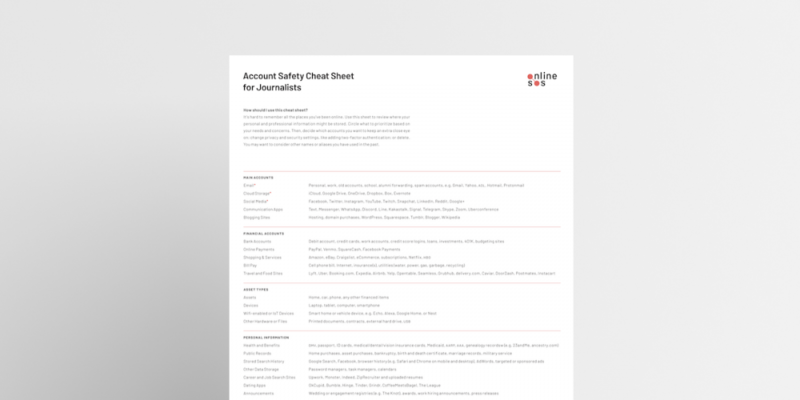 Download this account safety cheat sheet for journalists to start securing your digital footprint. Pew Research found that up to 56 percent of people wait until they face online harassment or witness online harassment to change privacy settings or other online behavior. Instead, secure, be aware of, or shut down these accounts now. Before you dive in, it’s worth noting the importance of password security and two factor authentication. If you’re securing an existing account—for example, updating passphrases and implementing two factor authentication—make sure to also review these resources. Download the cheat sheet and share with a colleague, friend or your newsroom. You can also find more resources for journalists here. Have suggestions or feedback? Contact us at team [@] onlinesos.org. We’d love to hear from you.